This was my third JMT in a row, and my 4th overall, having hiked the trail in 1971, 2016, and 2017. Gary had hiked most of the JMT also, in his youth in the 80s. I think they went from Whitney to Bishop Pass. 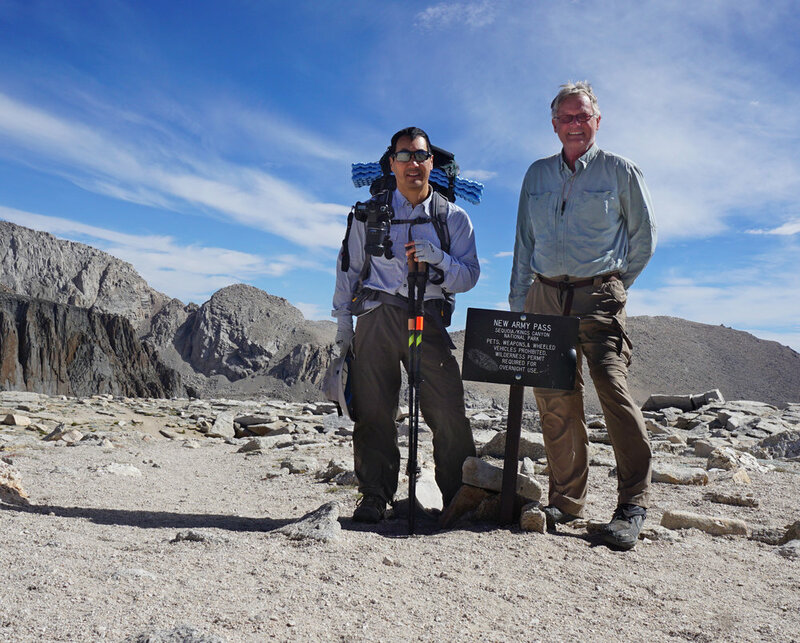 Gary was on the 2016 JMT also, but his son Tomio twisted an ankle and they had to head out at Kearsarge Pass. On that trip I continued on for a few days, but the water crossings were so severe that Ian Willnerd and I bailed out over Sawmill pass after a few more days. For this trip I thought I was probably in pretty good shape, having hiked for 6 weeks on the Camino, and at relatively high elevations in the White Clouds. Nonetheless, I had some altitude acclimation and training to get in shape once we got started. Something you have to decide in hiking the JMT is whether you want to start in the North, and head South (southbound) or vice versa (northbound). I’ve done it both ways, but when driving from Idaho its a lot easier to leave a car at Tuolumne and then drive to the southern end, and then hike to the car. Plus hiking northbound the permits are a lot easier to get. That is what we did, starting at Cottonwood, 2 days hike south of Whitney, and heading north. This starting point meant we didn’t have to go over Trail Crest on the second day, with very full packs, and with little time to acclimate to the altitude. Starting from Cottonwood allowed us to start at close to 10,000’, and have a short 6 mile hike the first day, to Long Lake at about 11,000’ elevation, Even though it was easier than later days, it was at high elevation, and our packs were full. I was pooped when we got to Long Lake, below, with 14,000’ Mt. Langley behind. The next day we headed over 12,500 New Army Pass, and I felt stronger than I had the year before. Gary of course was hardly breathing hard at the top, but I was pooped. Our second nights camp was on Rock Creek, near the junction with the PCT, and we availed ourselves of extra time to wash clothes and rest up. The next day we headed up Guyot Pass, and on to Crabtree Meadows for our third nights camp. We ran into Glenn Ray on the second day above our meadow where we camped. He was the leader of our group for the upcoming food drop via mule packer. When we crossed Wright Creek we met two guys who would become our friends, and we hiked with them in later days. They were Nam and Joe, both from New Orleans. This was their 2nd or 3rd actual backpack, and they were doing surprisingly well. Of course being 22 helped a lot. The next day’s journey would typically be to Tyndall Creek, but we kept going to a lake at about 11,000’, below Forester Pass, and we got hard frost that night. I was testing a 32 degree down quilt, and I kept saying to Gary how much I liked the quilt. Gary had a 10 degree down quilt, and I think I was warmer than he every night. However, from the picture below I think Gary was having a good time! Below is an unnamed lake on the vast Bighorn Plateau, which has a view of the Kaweah peaks, as well as Whitney. We camped at a lake east of the trail, at about 11,500’. We could count on it being cold any time we camped at 10,000’ or above, and it was cold that night. I wore every piece of clothing I had, and I was warm enough to sleep. I picked up a sock that had been damp the evening before, and it was as hard as a piece of wood. I don’t know if the picture below conveys how cold we were, but we were in the shade of the mountain when the sun came up, and we were freezing. We usually got up at 7 or 7:30, and were on the trail by 8 or so. We often wore gloves and coats for a few miles until we warmed up. I had oatmeal and coffee for breakfast, the oatmeal not my favorite food, but its compact and fits in a bear canister well. I added nuts and dried fruit, and brown sugar to the oatmeal, which helped get it down. We usually did a pass every day, and the 5th day’s pass was Forester Pass, at 13,500’. Forester is almost visible in the distant ridge in the picture below. This was our tent at the lake at 11,500’, as the sun got to our tent. From Forester Pass we camped at a bench above Vidette Meadow. Glenn ended up staying there too, so we knew we would both get to the food drop in time the next day. The view below was taken as we left camp that morning, looking up toward Forester Pass. When we started out that morning, were pretty low on food, but we figured that was OK if we in fact got food at the scheduled food drop later that day. We got to the meeting point on the Charlotte Lake junction, waited, and waited. We had calculated our food stores so closely that we really needed that food drop even for even our evening meal. Being diabetic, I didn’t want to risk going without meals for who knows how long. At 3:30 PM we decided we still had time to get to the Onion Valley trailhead over Kearsarge Pass. We headed out, passing the mule string at about 6:00-6:30. We were tired enough that continuing on to Onion Valley made more sense, and the packer agreed to leave our food at the Charlotte Lake ranger station. We passed Bullfrog lake, as seen below.